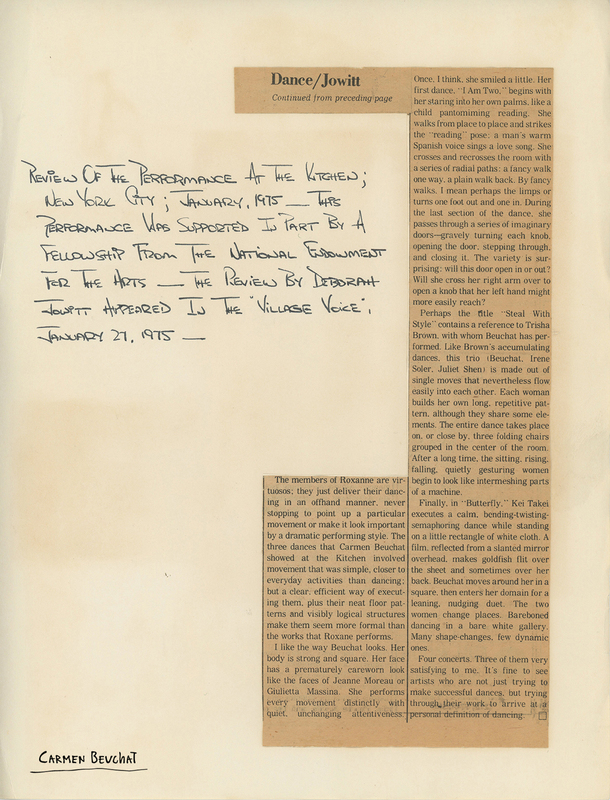 Press review written by Deborah Jowitt about three of Carmen Beuchat´s work at The Kitchen, published in weekly paper The Village Voice on January 27th, 1975 in New York. These works by Carmen Beuchat were presented together with works by two other choreographers that same night. Carmen presented: “I Am Two: The Line Straight Ahead, Right, Left – The One Who Passed The Door And the Door Itself”, “Steal With Style: We Are the One Who Sits at The Right And The One Who Sits At The Left” and “Buterfly: In A Logical Structure Life Goes By” with dancers Irene Soler, Juliet Chen and Kei Takei. In an attached note, Michael Moneagle mentions that this was partly financed by The National Endowment for the Arts.